The faithful of the church should be obedient to the rule of the church and as such the current Bishop of Mostar has authority to ask these things of Mirjana, Sister Elvira. However it is also clear that the previous bishop as well as the current have openly attacked the Medjugorje apparitions even while the Medjugorje apparitions were or are now, under investigation. Church guidelines state while a formed Commission is investigating claims of apparition, the order of the day is silence. Both Bishops of Mostar have not been silent as are church guidelines. In fact, Medjugorje USA has a classified document that state Bishop Zanic was told by the Conference of Bishops that govern Bosnia that he was not to openly speak out against Medjugorje. Zanic was disobedient to his superiors as is the current Bishop in disobedience during the current investigation by the newly appointed Commission in September of 06. The question I have to wonder is should the faithful be obedient to a Bishop when the Bishop himself is not obedient? Scripture tells us "If a blind man leads a blind man, both fall into the pit." If therefore the current Bishop is blind to his superiors, should the faithful be obedient to the Bishop? If yes, this could be as the blind leading the blind, in the name of obedience. In matters of claimed apparitions, a formed commission (by the local bishop of a diocese) can take many years to determine if an apparition has any real merit. Commissions that investigated visionaries such as St. Bernadette of Lourdes, France or the three peasant children from Fatima, Portugal, moved slowly before their final approvals. In other cases such as Garabandal, even though there were hundreds of unexplainable mysterious events, the local bishop swiftly did not approve the apparition. The Medjugorje apparitions are far more complex due to the first tainted Commission under the direction of local Bishop at the time, Pavlo Zanic. The Vatican for the first time in history was left with no choice but to form a second commission because the first was tainted with unbelievers by the local bishop. The Vatican became aware of the tainted Commission when U.S. Ambassador to Yugoslavia, David Anderson's sent the Vatican a classified document called an "AirGram." In the AirGram sent to Vatican, Rome, Anderson stated that each member of the Medjugorje Commission had publicly announced they did not believe the Virgin Mary was appearing in Medjugorje. Anderson also noted that one member of the Commission who did not believe, went to Medjugorje and had a change of heart. As soon as the head of the Commission (Bishop Zanic) learned this Commission member now believed, he was dismissed from the Commission. This AirGram is in my personal possession after my two years of tribulation to have this information released under the "Freedom of Information Act." Just a month after the 25th Anniversary of the Medjugorje apparitions once again the Vatican who said they would not investigate Medjugorje again till the apparitions were over, announced they would form yet a third Commission to investigate the Medjugorje apparitions. This change of heart is believed due to my book that came out in 06, "Medjugorje Investigated," which supplied documented proof the previous Commissions were tainted. 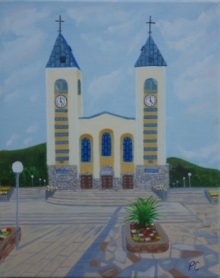 The third Medjugorje Commission formed September of 06, to date has not released findings. It is unknown at this time if Mirjana will publicly have the apparitions on the 2nd of the month. Some say there was talk of having it on Apparition Hill or at Blue Cross. Apparition Hill would be a difficult climb for Mirjana as it is a know fact that she has problems with her knees. The climb up Apparition Hill some say is not possible for her anymore. It is impossible to know if at this time Medjugorje USA will be able to continue to offer videos of Mirjana apparitions on the 2nd of the month. We are hopeful if her apparitions are not public anymore that the message of Our Lady will still be given to the public. One thing I do know for sure is that we all need to pray over this because Medjugorje is under attack once again. Community Cenacolo has been an incredible worldwide outreach for children and young adults suffering from drug and alcohol addiction. In a time of deep physical and psychological struggle, children need positive spiritual forces to help them overcome their trauma, sufferings and addictions. The demand of Ratko Peric (Bishop of Mostar) that Sister Elvira stop Mirjana apparitions at Community Cenacolo, hurts the spiritual growth of children during a most desperate time of need. It is also worth considering that Mirjana's apparition on the 2nd of each month has a ripple effect in that hundreds from around the world visit Community Cenacolo every month to be there while Mirjana has her apparition. The apparitions at Cenacolo incidentally brings in much needed donations, allowing Community Cenacolo's worldwide drug rehab projects to continue. The monthly apparitions also provide continued awareness of the mission of Community Cenacolo to a worldwide audience. This fact alone certainly creates the ability to raise funds necessary for continued growth and rehabilitation. Why does a Bishop, remove a much needed positive spiritual force from suffering addicted children? Why does a Bishop place a successful well proven and worldwide established organization designed to free children from drug and alcohol addiction, in jeopardy with possible financial woes? Scripture say's, "a seed in known by its fruit" and if this is the case, the growth of Community Cenacolo and the hundreds of children who today are clean from their addiction is awesome testimony to the good fruit. Bishop Peric's demands on Community Cenacolo can only squash the good fruit from continuing to be as effective in saving the lives of children. The way I see it, Bishop Peric's authority as Bishop of Mostar will lower the survival rate of addicted children by removing a strong spiritual forces for their development and treatment. Peric's forceful obedience to his word will also decrease Cenacolo awareness and ability to raise much needed funds to continue their work. Peric's actions will leave children unassisted and left to struggle and or die in their addictions. As much as I personally love our beloved Church and desire to be obedient to the rule of the church, I can not accept the actions of Ratko Peric. Seems to me all Peric cares about is his ability to rule with an iron fist, demanding obedience to his rule. His actions in this case show how little he cares about children in comparison to how much he cares about his complete control over others. Peric's actions are not acts of love but more works of dictatorship and self worship.